After the turn of the century, Mies transformed from a passionate self-taught architect to a modern icon in architecture and furniture design, along with his colleagues Frank Lloyd Wright in the United States and Le Corbusier in France. 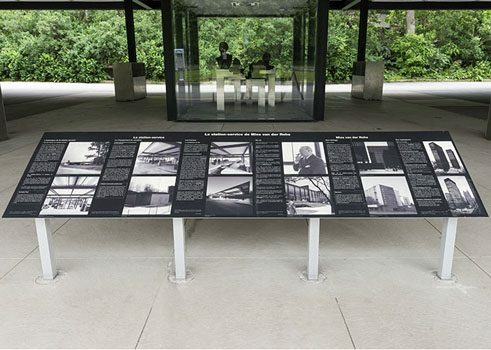 Mies acquired a strong reputation, thanks in part to his time as the last director of the world-famous Bauhaus school, which was a pioneer in modern architecture and industrial design. However, the school was forcibly closed by the Nazis in the 1930s, and Mies moved to the United States in exile. In his new adopted country, he began his second career, which brought him world fame and international renown in the last three decades before his death. Some of his particularly well-known works include: the Illinois Institute of Technology university campus (1940s); the apartment buildings at Lake Shore Drive 860/880 in Chicago (1950/1951); the Seagram Building in New York (1954-1958); and his final work, the Neue Nationalgalerie in Berlin (1969). It was during this time that he designed the Montreal gas station, undoubtedly one of his most unusual projects. 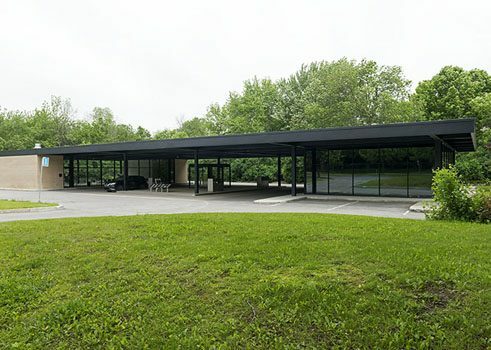 However, it is also an excellent example of Mies’ architectural style, and it makes the essence of his theory and practice accessible to every architecture lover. 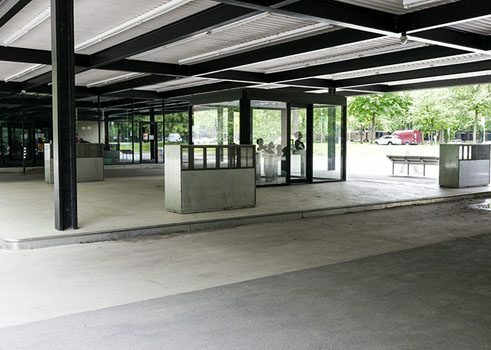 In 2011, the Montreal architecture firm FABG carried out restorations and renovations on the gas station, which had been abandoned and was at risk of dilapidation. They remodelled it, turning it into an intergenerational community centre (called a maison des générations), while still respecting the elements and concept of the overall Miesian approach. This was done by integrating building materials that were new at the time, such as steel, cement, and glass, with current technologies for the highest possible architectural quality and aesthetic. Mies’ well-known motto “less is more” and his goal of connecting the practical and the beautiful can both be seen in this work. The cantilevered roof lies on top of twelve massive welded steel beams, looking as if it’s floating. It covers two glass structures, which are unconnected from each other. The glass structure on one side was once an auto workshop, and the gas station itself (including a shop) was on the other side. They are separated by a small, centrally located glass cube, which functions today as the key depot for a municipal car-sharing program. The wonderful simplicity of the overall construction is highlighted by black-varnished steel beams and pillars (which contrast with the station’s white, enameled panels) and the geometric stripes of fluorescent lighting installed under the roof. Visitors to the gas station should also pay attention both to the landscape design immediately surrounding the station and to its location in relation to the adjacent residential area. Mies himself chose the spot, as he considered these elements to be just as important as the construction of the gas station itself.